Relate: “This isn’t my war.” That is what an ordinary woman named Jael could have said. The Israelites had been commanded to drive the Canaanites out of the land. That was too much work and now, a couple generations later, it was those same Canaanites who were driving the Israelites under. God raised up Deborah and Barak and in a miraculous battle they put the Canaanite general named Sisera to flight. This war was between those Israelites and the Canaanites. Jael was from a third group, the Kenites, who were on good relations with both sides. I guess you could say they were Switzerland. At least, that is what Sisera thought. In his flight from the battle he should not have lost hiding in the tent of a Kenite woman named Jael. She gave him comforting words, a decent meal, and then a place to lay his head. He thought he was safe. She, however, knew that neutrality cannot exist when injustice and oppression are at stake. Yes, I said stake on purpose. Let me say it again. Jael decided to raise the stakes and, well, she hit the nail on the head. React: Jael could have said, “It’s not my business. This isn’t my war.” She saw how Jabin, Sisera, and company were oppressing the Israelites. She knew what was happening, but it was not effecting the Kenites. Yes, they had relations and history with the Israelites, but they were also on good terms with the Canaanites. Why upset that balance. No matter who came out on top, the Kenites would be fine, but if Jael killed Sisera only for Jabin to raise up another general who beat the Israelites and then turned on her people to get revenge? Why risk it? Yes, there are 27 million slaves in the world today but they aren’t in my town. Yes, there is injustice and oppression in places like Syria, Kurdistan, Somalia and many more, but they don’t impact me here in the US (or Canada, the UK, the West or Australia). Yes, the Dalits live under constant oppression, Christians in Nigeria fear the terror of Boko Haram, and women in pretty much the entire Muslim world but why should I be involved? “This isn’t my war.” Hogwash. If we are Christian than it is our war. Just look at the words and actions of Jesus. When speaking and dealing with the outcast and the marginalized He always speaks with love and compassion. He saved his most scathing remarks for the comfortably religious. So we have the same choice as Jael. Will we sit back and do nothing or will we follow our Savior’s example and raise the stakes? Is this my war? 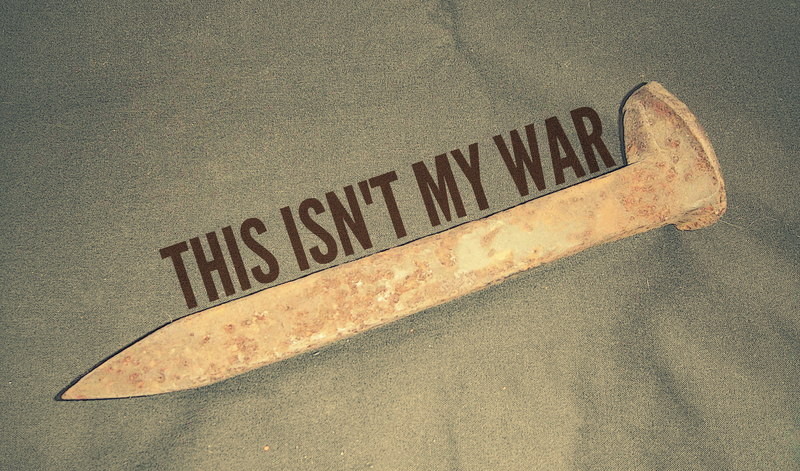 Please, please don’t ever let me say, “That’s not my war.” Give me a deeper passion for justice and help me to seek and find opportunities to make an impact just as Jael lured Sisera instead of just letting him run by. Help me to be intentional about spreading justice both in my community and around the world. Most of all help me to never forget that the most crucial human right is that everyone deserves to hear and adequate and relevant presentation of the gospel. This along with water, freedom, and equity are human rights that cannot be denied and which we all must be actively about. This is my war, God. Help me to fight it well. The best part is we will win the battle–because, ultimately, the battle is the Lord’s. The Lord bless you as you advance His kingdom–of justice, mercy and love. And one day when He comes back, he will govern the whole earth. Perfect governance! Shows how one person can make a difference if they are willing to step out and be a person of action and not just words. Enjoyed this! Armored up and moving out–expecting God to lead me in all things! Your words both move and shame me. Thank you for this! Well, I’m awake now! Thank you my friend. Awesome post. Wake up call. Dear Lord, give me the strength and courage to always go to war on my knees,for the suffering,marginalised and the helpless.Amen. Great post. Thanks for stopping by and liking my post. And then when we get off our knees help us to continue to war for you through our words actions and sacrafice. Yes, everyone can do something!!! We all have a calling in the Lord’s army. Thank you. It is my battle because we are One in Him. Convicted. I have, for a long time, tried to tend to my ‘own back yard,’ which encompasses racism, the oppressed, the poor, the depressed and mentally ill, the disheartened, the disenfranchised, etc, and have avoided watching the news, the political debates, etc. I was quite outspoken after the Mother Emmanuel episode last June where Grace trumped Evil, but my outbursts got nowhere and I became very disillusioned. But, your words have touched my heart. I will consult with Jesus and see just where and how I should broaden my view and what I should do to help. It is human nature to want to only look after what concerns our own and ignore what does not directly effect us. But to be Christians, we are called to be more than our human nature. Great post, very thought provoking. Let us be armed and ready to engage , the Lord leading us. Please God grant me the grace to continue fighting against the rulers of darkness.. Father lord i pray! I’ve always loved the story of Deborah and Jael. Historically I think the stories featuring women in the Bible haven’t gotten enough attention, so the messages in them haven’t been shared. I really appreciate this post. Thank you. My cousin is named Jael so this has been a family favorite. Oh wow, that’s really cool. Jael is a beautiful name. Our bad spelling is a product of the Germans. For them the “j” makes that sound. We English have kept Germanic spalling in our translations and use of Biblical names and places but the pronunciation has changed. When I’m reading it sounds correct in my head, (Israel = yits-rah-EL) but in teaching and writing I use the common spelling and pronunciation. Being correct here would only be a distraction. Informative. I’d somehow forgotten the long chain of Biblical translations of which you just reminded me. Many years ago, I bought a corrected version of the OT in Yerushalayim; I cried when I read what they had done to bring it back to the original. G-d is Eternal and the Word of G-d has never changed. Why change it?